Dave Kirton, with Ian Tyerman and Rob Carter 108 miles, Bourg d’Oisans, Col du Glandon, Col du Telegraphe, Col du Galibier, Bourg d’Oisans, Alpe d’Huez. After ten months of talking about the Marmotte after visiting the Alps last September, it’s finally arrived. We have spent more time talking about it than the event will probably take. How hard will it be? What training do we need to do? What gears do we need? And so on! 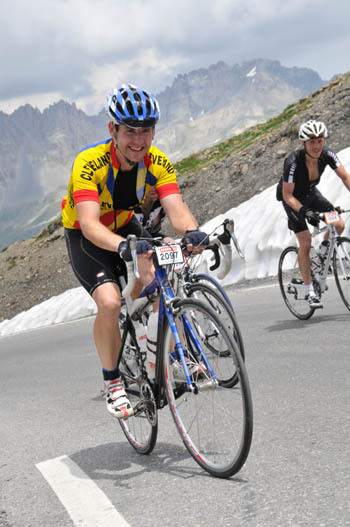 Rob has read the reports and apparently the Marmotte is supposedly one of the hardest sportives in Europe. However, myself and Ian disagree. We have both said it’s just long steady climbing whereas our local sportives such as the Rydale Rumble and Richmond 5 Dales have much more difficult steep climbs. Now the talking’s all over and its time to answer the questions. 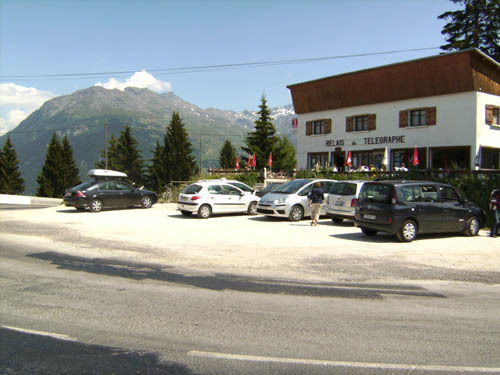 We had a long day getting to Alpe d’Huez, after a two hour delay at Leeds Bradford airport and some difficulty sorting the car hire at Geneva. We finally hit the road at 7 pm for the two hour something drive to the Alpe. Ian is the designated bus driver and we make it to Bourg for about 9.30 pm. Thinking that all the food in the hotel will be gone we quickly grab a tasty pizza in Bourg before driving up Alpe d’Huez. It appears much steeper and longer than we remember as we drive up in the dark. We find the hotel Chimony and get checked in. It’s a good little hotel. Rob’s done well booking it, £121 each for 3 nights, breakfast and evening meal. Friday 3rd July. The day before. Have you got any massive sprockets? After a tricky nights sleep I wake up about 7.30. Looking out the window there are great views of the mountains and a ski lift going past. We get breakfast and then start getting the bikes together. We have a spin around the top of Alpe d’Huez to check the bikes and descend a couple of hairpins and back up. We are not fancying going right to the bottom and back up again like some riders. It’s then off to register and get our numbers, timing chip and goody bags. There’s loads of stalls selling all sorts of cycling equipment. 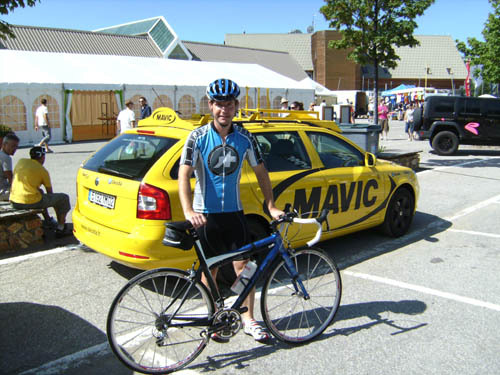 There’s also a free Mavic service van and Ian asks them to take a look at his freehub body. They whip it off, oil it, check it over and have it running smoothly in about two minutes. We head in to the sports centre to register. Rob’s in the queue for rider numbers 501 to 2000. Myself and Ian are in the 2001 to 4000 queue. Then there is the 4001 to 7000 queue! It doesn’t actually take too long to get sorted. Whilst waiting we get talking to several cyclists who have ridden it before. They all say that the hardest part is hitting Alpe d’Huez after already doing 100 miles over three large mountains, well that’s no surprise. Apparently there is usually carnage on the Alpe with riders collapsing all over, with some people reportedly taking two to three hours to climb the final 13 k. Great, I just hope it’s not us! After we get sorted with the bikes and registration we head to the car to do a full recon. This maybe isn’t a good idea as the general opinion is that things usually look much more difficult from the car. I hope this is true as the climbs and descents all look difficult from the car and it takes over four hours just to drive round. We take all the scenery photos on the way as we don’t plan to be stopping and taking snapshots on the event day. On the evening before judgment day we make our final bike and equipment checks. There is a good meal laid on for us at 8 pm. I think they know that they just needed to serve up loads of good pasta and all the cyclists will quickly hoover it all up. It must be said that the food and hospitality in the English-run hotel is top drawer. The staff are even going to get up early and do us all a breakfast at 5.30 in the morning. Whilst we are eating our lasagne Rob spots a blob of ice cream on a dessert as it goes past. He begins to worry that eating it will affect his performance! This gives me and Ian much source of amusement as we imagine Rob being destroyed on the Galibier as the small blob of ice cream does its worst. He soon changes his mind when it’s served up in front of him with a slice of apple pie, it disappears down his throat in seconds! We head back up to the room for an early night. We do a lot of talking before we can try and go to sleep. I have difficulty concentrating on my report writing as Ian has just come up with an amazing assessment of the ride. I think what he’s been on about for the last ten minutes is breaking the ride down in to individual sections of average speed to come up with an overall average speed of 12 mph which would get us round in nine hours, not including stops! Me and Rob are both looking at him in amazement. Rob’s also still discussing his nutrition strategy and there’s still a lot of other unanswered questions. What will it be like at the start with so many riders? What pace should we set on the Glandon? Do we stop at the first feed station for water? Have we got low enough gears? To be honest I think were all quite worried. After all the talk, not finishing the ride just isn’t an option! Sat 4th July. Judgement day. The big day arrives. After hardly sleeping at all the alarm goes at 5.15 am and it’s time to spring into action. Despite the poor night’s sleep I actually feel o.k. we get straight down for breakfast, there is porridge, cereals, fruit and croissants, I also get some tea and coffee down my neck. Rob takes a few anxious looks back over his shoulder at the breakfast bar to make sure he hasn’t missed anything. We get back up to the room, get our gear on, get the bikes out and like a military style operation we’re ready to roll down the Alpe in no time at all. I have arm and leg warmers on and a rain cape to descend down the Alpe. Luckily the weather is really good and it isn’t too cold dropping down. But we do need to carry all the warm clothes. If it starts to rain on the Galibier in the afternoon things could turn very cold, very quickly. Hopefully this won’t be necessary but as Ian has said “prepare for the worst and hope for the best” we found this a really good way to think about this ride when we were preparing for it and deciding what equipment to take. I really enjoy the descent down to Bourg and I am buzzing despite the early start. Already we have passed several riders that have punctured before they have even started. We get into Bourg and filter in to our different lanes. Basically this is how it works. The road is barriered off into two lanes which are then split into a further two lanes to filter the cyclists into the correct holding areas. There is 0 to 2000 of which the first 500 are the top riders. Rob is 746 as he got his entry in early. Then there’s 2001 to 4000 which myself and Ian go into. I am 2094 and Ian’s 2025. Then the last lane is 4001 to 7000! I think they closed entries at 7000. Anyhow me and Ian filter into our holding area and wish Rob good luck as he heads to his. To be honest Rob is better off riding his own ride. He is much stronger than either myself or Ian now and he has recently gained his second cat racing licence after only being fully in to cycling for three years, and despite his denials he’s probably going to attack the course. Whereas me and Ian are going to treat it like we’re cycling to Castleton tea shop and back half a dozen times. The time ticks by and at 7 am it’s time for the first 2000 to roll out. They gradually start squeezing out over the start line and by half seven it’s time for our 2001 – 4000 group to go. We squeeze out onto the high street, one foot in the pedal as we paddle along with the other foot on the floor. As we approach the start line we manage to get both feet in and ride over the start line. There is a start mat that you ride over which registers the electronic timer (dibber) around your ankle. These timing mats are placed at various key points on the course. As we roll out there are crowds cheering and a brass band playing “when the saints go marching in” it’s a great atmosphere and very well organised. We were warned about how crowded the roads would be over the first few miles, but as the riders spill out over the start line they spread out nicely as they are gradually released. The Col du Glandon. 1924 m.
We’re off! It’s 7.35 and we’re both sailing off down the road. A slight downhill seven km to the right turn which takes us over the Glandon. It’s great, just like a giant spread out club run with cyclists for miles in front and behind. Some take it easy, others nail it down the outside to gain places. Me and Ian just go with the flow. We turn right up towards the Glandon which is confusingly also called the Col de la Croix de Fer depending upon which way you go over the top. I ask Ian if he is ready for the first of four appointments with pain. At this point we are still laughing! We climb up the side of the dam that the tour came down a year or so ago. It’s then flat for a couple of k, then we hit the base of the Glandon. We had ridden the Glandon the previous year so we knew that it was more difficult than the profile suggests. It ramps up steeply for several k before levelling out, then there is a short descent then it ramps up again, before steadily climbing past more scenic lakes and dams to the top. We set a steady pace as planned, but I begin to get irritable as riders continually pass us. We could easily stick on another one mph, but Ian talks me down and convinces me that we need to stick to the plan if we are to have anything left at the end. I can also hear the voice of Phil Meadows in my other ear with his talk about how he used to break his endurance running down in to steady blocks, and this way he would eventually catch up and overtake the runners that had set off faster. So with me brought back into line I let Ian get on with his controlled pace setting. The top of the Glandon arrives quite nicely after 2.04 of riding. We’re both wondering where Rob might be now and I suggest we should have fitted him with a Rob cam! It’s mayhem at the feed station at the top. We had planned not to stop but we need enough water to make the descent and the long valley road before the next feed station at St Michel de Maurienne. We descend off the Glandon down to Saint Alban des Villards. It seemed like it would be a difficult and dangerous descent when we went down in the car, but on the bikes we flow down easily. I would rate us as average descenders but we seem to flow past other riders easily, even though we’re riding cautiously. It’s a long technical descent down and takes about 30 minutes to reach the bottom and my wrists feel like snapping as we hit the speed ramps going into the town. We press on along the supposedly flat road towards St Michel de Maurienne and the base of the Telegraphe. The road is really heavy and its now getting towards 11am, the temperature is getting up towards 30 deg C. At one point I indicate to Ian to pull over. I’m convinced that my back brake has jammed on, but it’s fine, it’s just the false flat and heavy road taking its toll. We settle in to a good group and make it to the next feed station at the bottom of the Telegraphe. There’s more mayhem at the feed station as we grab water and prepare for the ascent of the Telegraphe. The Col du Telegraphe is supposedly the easier of today’s four climbs. Just a warm up before the Galibier! We climb up steadily. Ian’s setting the pace again, but with the heat and the continuous gradient starting to take its toll the Telegraphe starts to sap our energy reserves. Anyhow we manage a good pace, doing the 12 k to the top in just under an hour. We seem to be starting to pass many riders on the way up that are beginning to have difficulty with the conditions. I take time to look over the edge at the sheer drops down to the town below. It’s like taking off in a slow aeroplane, then I get back to focusing on Ian’s pace setting. It’s interesting watching other people’s styles. Stronger riders pass us and disappear, others seem to repeatedly sprint past and then go back over which seems a waste of energy, whilst others simply go back over. The other funny thing I have noticed is that there’s no talking? It’s like a slow silent race. Everyone is in their own little world of concentration. We reach the top at 1570 m. There’s another feed station and we top up with supplies again. There’s less mayhem this time. The Telegraphe has been a steady gradient over an hour but with the heat it’s started to take its toll on both of us. It’s a pleasant descent of 5 k to Valloire. Now it’s time for the biggey. The Col du Galibier. 2642 m.
As we climb out of Valloire the sign says Col du Galibier 17 k, great! 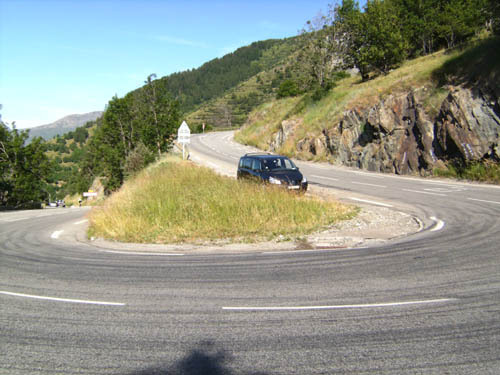 Now this climb didn’t seem too steep when we went up in the car and we had cycled up from the Col du Lautaret side last year and it was o.k. but as we drag up, the length of the climb combined with the heat and 60 miles already in our legs starts to take its toll. We seem to be steadily passing riders again but as we hit the 10 k to go, we both start to get in to difficulty. Ian suggests I ride on by myself as he’s suffering, but after a couple more k I have to let Ian go as I suddenly begin to feel sick and my power is failing. I arrange to meet Ian off the descent at the other side of the Galibier, top of the Lautaret. With about 5 k to go I’m in real difficulty. My legs have gone and I feel like I just want to get off and throw up. Ian later tells me he felt the same on Alpe d’Huez and a lot of other riders are looking in similar condition. We believe it’s due to trying to get all the food and energy drink down in such heat. Anyhow I decide I’d rather plod on slowly than stop. I endure one of the most torturous 45 minutes on the bike ever as I creep up this massive mountain at 4.5 mph. Even though I feel bad I try to take in the breathtaking scenery. There’s a thunder storm rumbling over the mountains behind, I just hope I make it over the top before it hits. As I look down to the valley below there’s still along line of cyclists all the way down. I’m just glad I’m not back down there. I try not to look up as there’s still several hairpins to go towering above me. There’s a continues stream of riders passing me. I’m really disappointed as it starts to look like my ride might be over. I have to pull on all my cycling experience and will power but eventually haul myself over the top. At the top I roll straight over and descend down to the Lautaret. Ian has been there about seven or eight minutes he says and hasn’t had the greatest time either. I get off the bike and go behind a car to be sick. Ian points out that there’s a family nearby trying to have a picnic. I hope I haven’t spoilt their dessert! Does this paint a lovely picture of the Galibier! I thought at this point my ride was over and tell Ian to press on as I put my emergency recovery plan in to action. I have five minutes rest and stock up with a bottle of water and another of energy drink. Now the descent off the Lautaret is a long steady one for about 25 miles back to Bourg with just a few smaller rises towards the end. So I steadily descend down, constantly sipping water. I pass riders again on the steeper part of the descent and after a while I get on to the back of a good group and my stomach begins to settle down. I start to gradually load up with gels and flap jacks, nibbling continually until we reach Bourg. I even do some turns on the front as my power seems to miraculously come back on. Hopefully that’s my bad spell over. But what a fine place to have a bad spell on the mighty Galibier. I arrive at last at the base of Alpe d’Huez. Reports later said it was 38 deg C at the bottom. I feel o.k. now the engine room has switched the power back on. I get stocked up with two bottles of water at the feed station. My plan is to steadily spin up the Alpe and most importantly keep cool by pouring water over my head. I settle in to a reasonable pace keeping up 6 mph. The longest steepest section is from the bottom to the first hairpin 21, “where Sastre attacked last year” I get to there and start counting down. I’m passing riders again and just keep drinking the water then pouring some over my head which feels great. Lots of riders are stopping and cooling themselves in the waterfalls that come down the sides of the cliffs, other riders are getting off and lying down. I would rather just keep plodding on. I get extra water handed out by supporters at the side of the road and I pour most of it over my head. I make good progress as the hairpins tick away and Bourg d’Oisans begins to look like a toy town below. I get to about 4 k to go and after my good spell my legs start to fail again as I have been climbing the Alpe for an hour. But look who’s ahead! There’s Ian at the side of the road. He’s off his bike and looking like he’s going to throw it over the edge. It’s Ian’s turn for a bad spell and he said he just had to get off for a minute as he has had enough of riding his bike. He climbs back on the bike and we both struggle the final 4 k to the top. It takes another 20 minutes or so to complete the final push to the top. Every pedal turn becomes more difficult. We pass many riders in much worse states or passed out at the side of the road. It’s Alpe d’Huez carnage in the heat. As the road levels off at the top the finish line looms into sight. We crawl over the finish line, it’s such a relief to finally stop pedalling. We both collapse on top of the bars and say never again! As we move through the finishing area there’s Rob looking fresh as a daisy. He shouts are you both alright, I reply we’re far from alright Rob. My legs start to lock up as I walk with my bike like John Wayne. Me and Ian have completed it in 9hrs 27 mins. Just 37 minutes outside the gold time of 8.50, so respectable I think. In fact Ian’s calculations of 12 mph were not far out as I register 12.2 mph average on my computer. But get this, Rob’s finished in 7 hrs 36 mins! We knew he would go well but didn’t think he would get round that fast. The winning time is 6.09 by a rider called Bart Dekker. But Rob’s finished number 335, up with the top riders. Rob takes our timers for us and exchanges them for certificates and Marmotte water bottles. That’s all you get for the efforts. No free T shirts and medals are ten euros. We get back on the bikes to ride the 500 m back to the hotel but I can’t actually do one more pedal revolution as the back of my legs have locked up. Back at the hotel I climb the three flights of stairs with great difficulty. We get showered off and collapse on the beds. It’s been a real long day! After an hour or so of recovery I persuade Ian and Rob that it would be good to take a walk out on to the Alpe to stretch our legs and watch the stragglers coming in. Some riders will take 12-13 hours to finish. There’s actually a cut off time of 6 pm at the bottom of the Alpe where they will take your timer off you which seems a bit cruel. Its half six and there’s still a steady stream of riders making the last bend. We give them a big shout as they go past. We have a lot of respect for these riders. Anyone who has made it has done well. At this point a rider comes by and I have to look twice in amazement. We all can’t believe it, I’m not kidding he’s got one arm and one leg! We’re awe struck. Now that guy deserves a free medal. It must be hard enough on the climbs but imagine him on the descents! Back at the hotel we shove down our tea. But then our big drinking session we planned on Alpe d’Huez turns in to two small bottles of beer. That’s all we can manage as w’ere just too knackered. That’s it, it’s all over. We pack the bikes the next morning and drive down the Alpe, stopping half way down to watch some of the riders that are time trialling up in an event called the Grimp. Most of these riders will have done the Marmotte yesterday. Some people really like their punishment! We drive away from the Alpe back to Geneva, and despite saying that I would never do it again we find ourselves already talking about how we could improve and the possibility of riding next year. Aren’t cyclists stupid! The Marmotte has been a spectacular event and very well organised. There were no problems at all with the number of riders at the start. And the instructions were all clear and easy to follow. The feed stations, although hectic, did very well to cope with the volume of riders. The route itself was spectacular if you took time to look around, but it was extremely challenging. The heat was a big factor, but equally it could have been really cold as in previous years. I’m just glad I did lots of long training rides for it otherwise that bad spell on the Galibier might have been the end of it. In answer to our earlier question, yes it is more difficult than our local sportives and I’m sure that it probably is one of the hardest in Europe. Although the climbs aren’t really steep it’s the sheer length of them. Out of the 9 hrs 27 min of riding I reckon that nearly six hours of it was climbing, or in terms of distance we’re looking at M’bro nearly to Scarborough uphill. Frightening if you think about it too much. The only thing we did get wrong was the gearing. I had a compact on, 34/25 and Ian and Rob had 38/27s which is nearly as low. These gears were fine in the Alps last year over shorter distances. But we could all have done with a lower emergency gear. Lots off the real good riders that past us had what looked like 34/27s on. From what Rob was telling us the top riders nail it round much faster but then just stick it in to the 27 and spin up Alpe d’Huez. The annoying thing is that I have a new set of 12/27 Ultegra sprockets in the garage! But I decided not to put them on. What a dummy. Well I think it’s been well worth the efforts. Now I’m going to do some armchair cycling in front of the TV for the rest of July watching the tour. Then I’m going to retire to Castleton tea shop all winter before one of us comes up with the next stupid idea! Posted on July 27, 2009, in Article. Bookmark the permalink. Comments Off on La Marmotte 2009.